No matter how large the project, your clients count on you to consider the impact of every detail – from the cabinet hardware to the kitchen faucet. And when it comes to a new home or a bath remodel, the hardware you choose can have a dramatic impact – bringing the entire design together with unifying design elements and finishes. For all the materials and services you need to complete your projects, you have people you rely on to deliver what you need. WalterWorks Hardware has earned the trust of builders, plumbers, architects, contractors, remodelers, and designers throughout the Maryland, northern Virginia, and Washington, D.C. region, including Annapolis, Columbia, Baltimore and Easton. Whether you’re building a custom home from top to bottom or completing a bath remodel and looking to match hardware to existing fixtures, WalterWorks Hardware can be an invaluable resource in the process. We’re hardware experts, and we understand the demands of your trade. We also know that hardware is often one of the last elements to be installed on a project. Even with new home construction or a months-long remodel, the hardware can’t hold up the process. That’s why we’ve made it our focus to quickly and effectively specify and deliver the right stuff the first time, to make your project a success. If you have specifications that call for items don’t carry, we work on the total package and make the unfamiliar parts work with the rest. No matter how custom the look, no matter how unusual the request, we go above and beyond to make sure you and your client get exactly what you need. When it comes to the details of a custom home or remodel, the old adage of “show, don’t tell” applies. No amount of planning, describing or visualizing can truly convey the design and functionality of hardware to your clients. Make use of our extensive showroom and let your clients see the beauty of your design choices with their own eyes, and feel the textures with their own hands. Even when you find yourself stuck in the process, our showroom is an excellent resource to find and explore ideas. If your clients are having difficulty narrowing down their choices or providing direction for your design, walking them through the traditional, transitional and contemporary options on display at WalterWorks Hardware can provide the inspiration needed to keep your project moving forward. 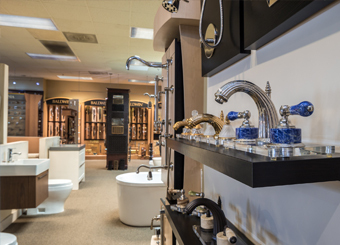 Interior designers, architects, remodelers, plumbers and contractors count on WalterWorks Hardware to supply hardware, faucets, and fixtures for the finest homes, kitchens, bathrooms in Maryland, Washington, D.C., and northern Virginia. We serve trade professionals and their clients in Anne Arundel County, Howard County, Montgomery County, Prince George’s County, Talbot County, Baltimore County, Queen Anne’s County, Fairfax County, Kent County, Arlington County, and Calvert County from our Annapolis showroom. If you’re a trade professional interested in partnering with WalterWorks Hardware, please call 410-263-9711 or contact us to speak with one of our experts.